When we got my wife’s CX-5 back in August, Android Auto was one of our select few gottahaveit features. But the CX-5 was the car we liked the most, and it didn’t have Android Auto. We knew there would be a retrofit available at some point, but specific information was scarce. That was good enough for us to keep the CX-5 on our list and ultimately choose it. And now, the retrofit has arrived! * Sooner as in, this is only a few months of waiting since we got my wife’s CX-5. 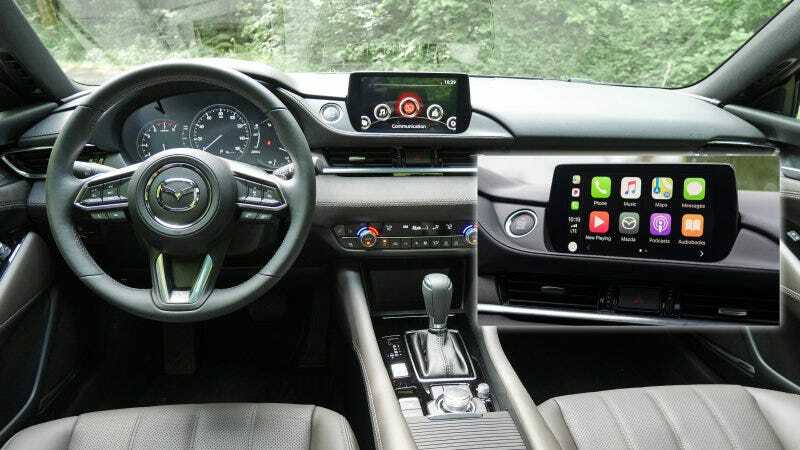 But I’m sure the folks who have 2014-up Mazdas with the MZD Connect infotainment system that this retrofit is for, have been waiting much longer and are probably like, FINALLY MAZDA, WTF TOOK YOU SO LONG? The retrofit kit is Mazda part number 0000-8F-Z34. It includes a software update and some new wiring including higher-powered USB ports to keep phones charged better while running CarPlay or Android Auto. Sadly there’s no quick charging tricks but at least the 2.1A ports should provide plenty of juice for most phones. MSRP is $199 and dealers are typically quoting another $200-300 for labor on top of that, which is a bit of a ripoff if you ask me. But, many dealers are already selling the kit on ebay or directly, for $160ish, and apparently it’s easy enough to install on your own. Before the retrofit can be installed, the MZD Connect system needs to be updated to a new enough firmware that supports the kit. The firmware is the underlying software code that controls the MZD Connect hardware. If you want install the retrofit on your own, you’d need to check your firmware version (it’s probably in the settings somewhere—I need to poke around in there to see the exact screen), then either try to get your dealer to update it for you, or attempt it on your own. I haven’t done a ton of research on this but this forum thread appears to have the firmware files. Proceed at your own risk. I’m tempted to do it on my own, but there’s a nagging thought in the back of my head that maaaaaaaaybe that could cause warranty headaches down the road if not done at a dealership. I’m not sure. It’s still a genuine Mazda part so I guess if I put it in myself and something goes screwy with the infotainment down the road, it’s not like a dealer would say it’s aftermarket and not honor the warranty. I dunno. Once I get past my paralysis by analysis, I’ll get around to deciding which route to the upgrade I want to take.